Open communication between brands and people creates progress. Nowhere is this more critical than when a person reaches out with a customer service inquiry or issue on Twitter which has rapidly become one of the best places for people to talk to businesses. Sprout has recognized this by enabling brands to reply to consumers in a timely and effective manner through a suite of collaborative engagement and response management tools. Today, alongside Twitter, we’re announcing plans for two exciting Direct Message features that help agents solve customer service issues in a more timely manner. These new features use a combination of simple automation and human service. Specifically, welcome messages and quick replies will help brands streamline their customer service inquiries and provide customers with efficient and informed responses. Sprout is currently working collaboratively with Evernote, a leading platform to capture, nurture and share ideas, to implement these tools and discover new, innovative ways to increase productivity for their team. Welcome messages and quick replies create efficiencies for the agents behind the @evernotehelps support handle. In turn, Evernote’s service agents can better serve their user base. Delivered in conjunction with the welcome message, four quick reply options enable the Evernote user to simply tap a button and let the agent know the nature of their issue or inquiry. Paramount to the entire experience is the transparency that the Evernote user is interacting with an automated message. Careful wording demonstrates this and sets the clear expectation that a human agent will step in shortly to ensure proper customer care. Automating this initial interaction guides the Evernote user to share the information needed without requiring a human to ask for it. It also eliminates a repetitive process for the Evernote agents which leads to a quicker and more informed resolution. When the agent steps into the conversation via Sprout’s Smart Inbox, they already have the context they need to begin addressing the customer’s needs. The features we’re building help by complementing the agent. The result is quicker issue resolution and happier humans on both sides of the conversation. While we would never advocate for only-automated social conversations, this suite of automation features has the power to enhance both the customer and agent experience by bolstering speed and efficiency. With this simple yet effective chatbot, Evernote expects benefits to be twofold. The brand anticipates a more informed support team with each Twitter interaction and a reduction in customer effort leading to a superior customer experience. 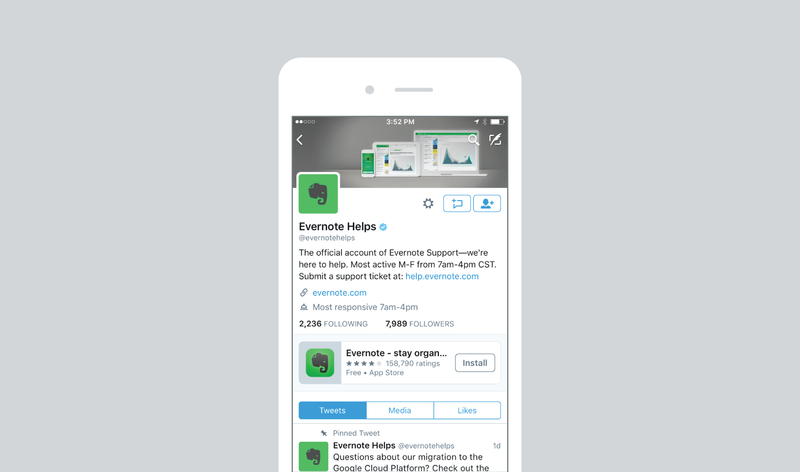 “In many respects we believe this is going to change the way our customers engage with us via Twitter,” said Geoff Barry, Manager, Support Scaling & Care Tools at Evernote. This is the latest effort of our continuing dedication to improving workflow and providing exceptional end user experiences for Sprout customers. In the past year, we’ve proudly worked with Twitter and forward thinking brands like Evernote, SoulCycle, prAna and Monarch Airlines to build tools that facilitate more productive communication between brands and people. Some of these feature updates include DM deep links, Customer Feedback and, most recently, Response Indicators. If you want to learn more about how your team might use Sprout’s features to better implement customer care efforts on Twitter, contact your Sprout representative or email sales@sproutsocial.com.